Abstract: Methods: This retrospective study includes all 557 corneal grafts which had been preloaded at the Lions Eye Institute for Transplant and Research (Tampa, FL) and subsequently transplanted since 2012 – when the preloading program began. The donor tissue had undergone pre-lamellar dissection, trephination, and loading into EndoGlide Ultrathin inserters and was shipped in Optisol GS to the surgeon. Donor characteristics, endothelial cell density (ECD), and graft central corneal thickness were recorded. The main outcome measures were intraoperative and postoperative complications at 3, 6, and 12 months. Results: Four primary graft failures (0.72%) and 3 rebubblings (0.54%) occurred. Reported graft dislocation rates in the literature range from 0% to as high as 82%. Reported graft failure rate as reported in the largest series to date is 7.6% by 1 year. Mean preoperative donor ECD was 2799 ± 231 cells/mm2. Mean graft thickness was 0.108 ± 0.020 µm. Mean death-to-preservation time was 11 ± 5.2 hours. Mean death-to-resection time was 113 ± 38.3 hours. Conclusion: Donor graft tissue preloaded by an eye bank can be used successfully for cornea transplants. Preloading at the eye bank reduces preparation variability as well as intraoperative tissue manipulation. Finally, preloading corneas at the level of the eye bank provides for superior outcomes compared to current practice standards. Summary: Traditionally, transplant surgeons prepare corneal grafts in the operating room prior to surgery. This practice leads to widespread variability which may contribute to cornea transplant complications. 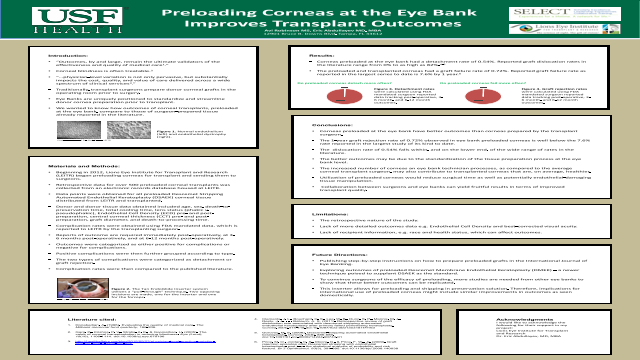 The purpose of this study is to evaluate the feasibility of preloading corneas at the level eye bank using a commercially available insertion device. We propose that by reducing variability of the tissue preparation process, outcomes can be improved.References: Donabedian, A. (1996). Evaluating the quality of medical care. The Milbank memorial fund quarterly, 166-206.